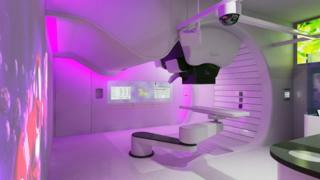 A £35m proton beam therapy cancer treatment centre is to be built as part of a £1bn development. The privately-run facility will be next to a new Royal College of Physicians site in the Knowledge Quarter in Paddington near Liverpool city centre. The Rutherford Cancer Centre North West could treat up to 700 patient a year, including NHS ones, from 2018. NHS proton beam units are being built in Manchester and London to open in 2018 and 2019 respectively. In general, it gives fewer side effects compared with high-energy X-ray treatments. The Rutherford Cancer Centre North West will also offer treatments including radiotherapy and chemotherapy. Knowledge Quarter Liverpool is a 450-acre district for science, health, technology, education, music and performing arts, Liverpool City Council said. Developments will be located on Paddington Central and the first £1bn phase of the 30-acre Paddington Village also includes a base for Liverpool International College. Mayor Joe Anderson said: "Momentum is really beginning to build for Knowledge Quarter Liverpool. "We can expect more exciting announcements which will further cement its reputation as a world-leading innovation district, specialising in medical and life sciences research."